Dawn took this picture the other day and showed it to me. 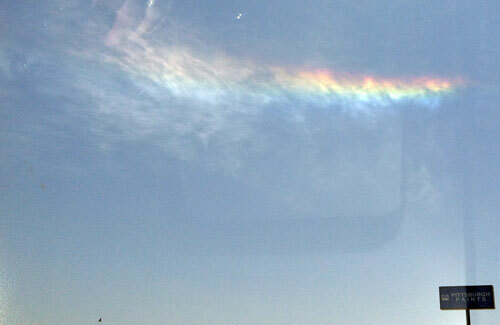 It is of a “cloud rainbow” that her and the kids saw. I’d never heard of a cloud rainbow and certainly never seen one before and she too was seeing her first one. When she pointed it out to they kids, they were like, “duh, we’ve seen these before.” Where have we been? I just wanted to know how many of you out there have seen these. Was I too busy living my life and not looking up to notice something as common as the kids made it sound? I even did some research online and found tons of images. The other term I have seen is “fire rainbow.” I’ve also heard some interesting lore that when you see one, it will almost certainly rain within 24hrs – even some instances of people having seen them just before major catastrophic weather events like tornadoes, earthquakes, tsunamis etc. Anyway… I think they’re cool and just wanted to share. NextYes, it was great… still unsure how good though.